I’ve had several requests for ideas on how to teach common measuring abbreviation and equivalency basics so I thought I’d throw my ideas into the ring. Recently, I discovered this review game called Grudgeball which is a fun and fiercely competitive game and I knew I had to try it with my students. Combined with other ideas I use, I found it to be a very successful way to reinforce students’ measuring abbreviation and equivalency knowledge and the quiz scores proved it! Certainly,others have some awesome, interactive ways to teach this topic so I encourage you to share with us so we all can benefit from them in the comment section below. Pass out index cards to students as they enter the room. (Note: You will have to make these up ahead of time.) Students will either have a term or an abbreviation or symbol of a term on their card. Students are to mingle and find their match. Once matches have been made, go over each and have students fill in their “ Abbreviations” section out on the Kitchen Measurement worksheet. 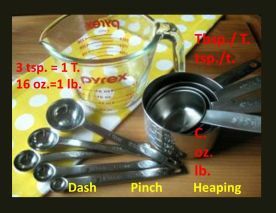 In order to familiarize students with the measuring tools I like to send them to their kitchen stations and have them interact with the tools and margarine while they complete the front of the Kitchen Measurement form..
After students complete sections A & B of the form, we go over it to be sure they’ve calculated and labeled everything correctly. This is where I would talk to them about measuring techniques used for measuring with each tool, show the measuring video and demo the super chip cookie recipe found here. I then explain equivalents by reviewing the Gallon Man graphic organizer they learned in grade school and show them how to read across the lines left and right to show what amounts are equal to each other. These are shown on the Kitchen Measurement form. Students then practice by completing section C on their form. After going over section C, I like students to put it all together, practicing with this Measuring Up worksheet from the Home Baking Association. Students are then give the opportunity to practice learning their common abbreviations and equivalencies with self-correcting flashcards in small groups. We then practice a couple of times as a whole class. I made mine up ahead of time on index cards, but you could have students create their own. I encourage students to practice and learn these on their own to prepare for the upcoming review game and quiz. Prior to their quiz, we play the review game “Grudgeball” found in the PPT below. This is an interactive game where students are placed in teams and compete against each other. The directions can be found in the PPT below. This is also completely editable so you can adapt it to meet your needs. I want to thank you for sharing your lessons…I have used many and all have been a great success….